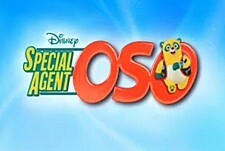 "Special Agent Oso" stars Academy Award-nominee Sean Astin as the voice of Oso, a fuzzy, lovable, bumbling special agent-in-training who enlists the help of viewers at home to complete his assignments. Paying homage to special agent classics, the series follows Oso, a stuffed panda bear who works for U.N.I.Q.U.E. (United Network for Investigating Quite Usual Events), an international organization of endearing stuffed animals charged with helping kids accomplish everyday tasks such as cleaning their room, brushing their teeth and learning how to use the library. Please give the Cartoon Series Special Agent Oso a vote between 1 and five stars, with five stars being the best, 1 being a show you absolutely hate, and a three for an average show. This Series has been viewed 3 times this month, and 6,677 times total. Special Agent Oso Episode Guide -Disney Studios @ BCDB by Big Cartoon DataBase is licensed under a Creative Commons Attribution-NonCommercial-ShareAlike 4.0 International License.